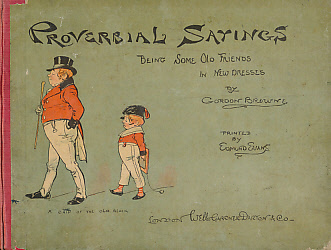 Barter Books : Browne, Gordon : Proverbial Sayings. Being Some Old Friends in New Dresses. 220 x 280 mm (9 x 11 inches) - 59pp. G : in Good condition without dust jacket. Cover rubbed and edgeworn. Shaken. Gordon Browne was the son of Phiz - and many thought him to be a more accomplished artist.